Every Sunday we do Burger Night at our house. We doors are open to any of our friends, and we may have from one to eight visitors on top of our usual four for dinner. We tell folks they can come over as early as 3PM, and cooking usually starts between 5 and 6. We have a fair number of games that are best with either small groups of people (four or less) or larger groups of people (six or more). With a few exceptions like Cthulhu Dice, most 6+ player games can take a long time to play. This means that if we start at 4PM and other people trickle in at 5 we may be right in the middle of a game that has the potential to run right up until dinner time. 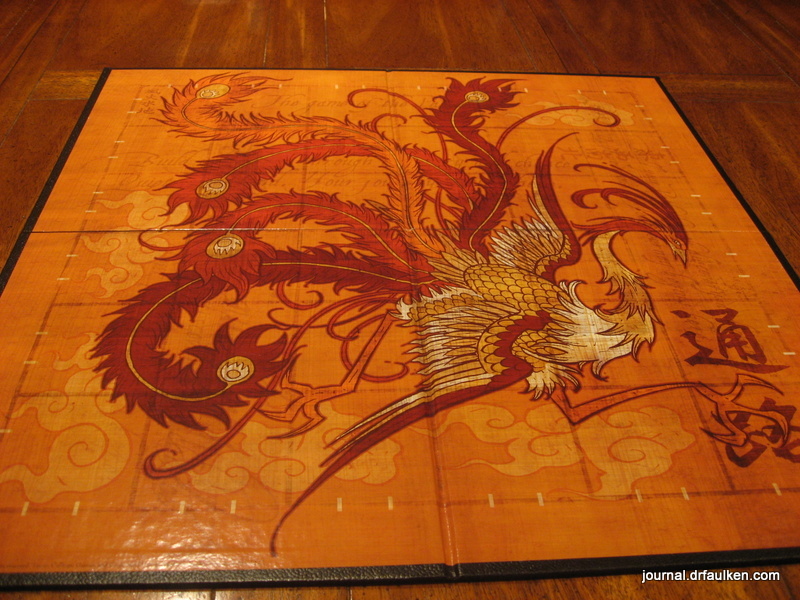 Tsuro, the Game of the Path, is a board game that accommodates a ton of people but doesn’t take forever to play. In fact, the more people you have, the faster it can go. 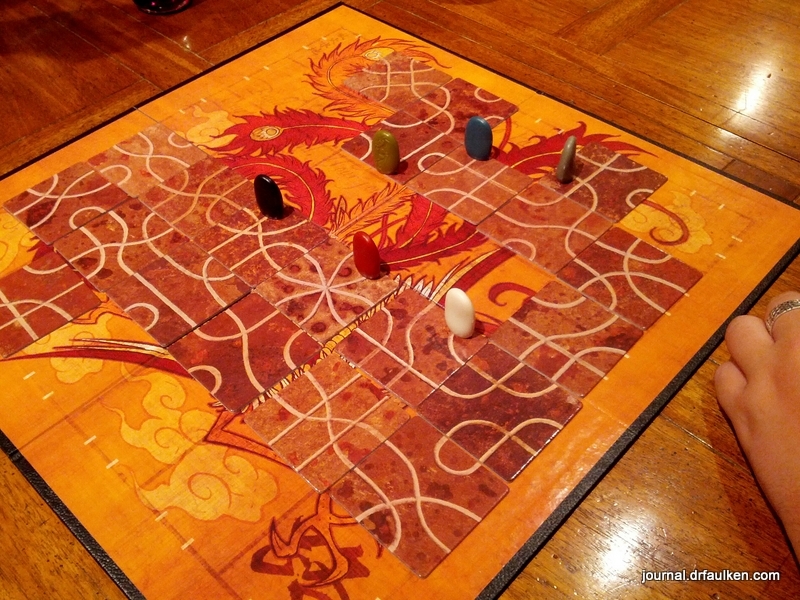 Tsuro can be played by two to eight players. You win by being the last token on the playing board. The board is a grid, with pre-defined starting points along the edges. Each player is dealt three tiles at the start of the game; all remaining tiles are placed in a pile. Players keep these tiles hidden until it’s their turn to play. Players decide where they want to start, and then the game begins. On their turn, players put one tile down on the board. If it’s your first turn, you have to put a tile down next to your starting spot. Once you place a tile, you move your marker along the path indicated on the tile. After your first turn, you must put your tile adjacent to the same tile your marker is on. Players draw back up to three tiles as long as possible. 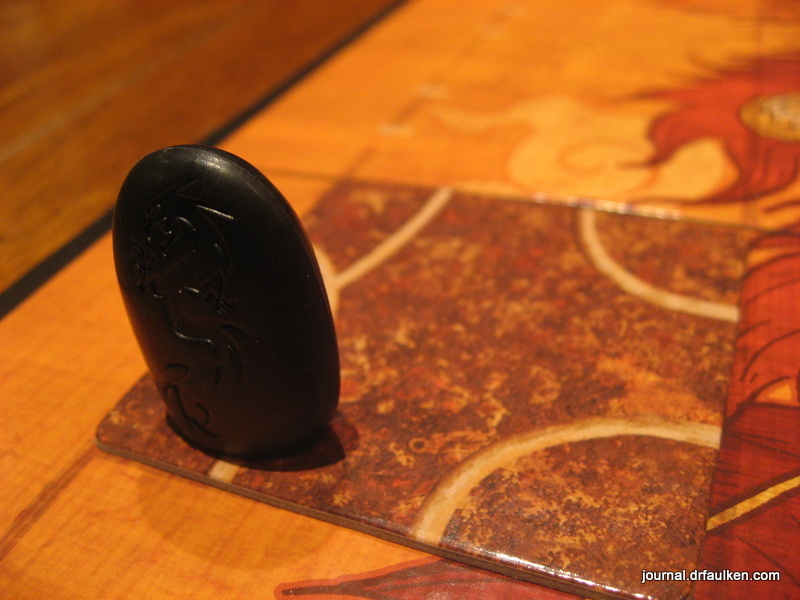 Players die in one of two ways in Tsuro: by colliding or by following the path right off the board and to their doom. As you add players the game becomes more chaotic, and I feel that it accelerates the pace of the game — something quite unusual. It is inevitable that paths cross and things go awry, especially later in the game. It’s quite common to think that you’re about to win, and then a player comes rocketing towards you or you are forced to follow a long trail that puts you in harm’s way. The game is a lot of fun, and takes between 10 – 20 minutes. If guests show up in the middle of the game they hardly have time to set their goodies down and say their hellos before another round starts. Overall, I can’t say a bad thing about Tsuro, although I do think the game is a lot more fun with more people. We’ve played it probably a dozen times with three or four players and it doesn’t have the same level of chaos as with eight. On the other hand, fewer players allow you to play a more tactical game. For less than $25 shipped from Amazon Prime, Tsuro the Game of the Path is a must-have for any gaming household.